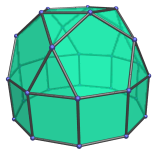 The pentagonal rotunda is the 6th Johnson solid (J6). 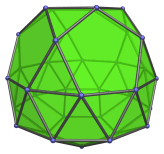 Its surface consists of 10 equilateral triangles, 6 regular pentagons, and 1 regular decagon. 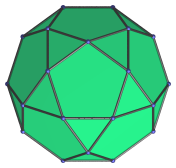 Thus, the icosidodecahedron may also be named the pentagonal gyrobirotunda. 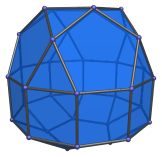 If the pentagonal rotundae are joined in ortho orientation instead, we obtain the pentagonal orthobirotunda (J34), another Johnson solid. 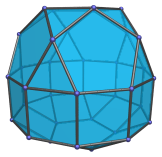 The pentagonal rotunda can also be elongated by attaching a decagonal prism to form an elongated pentagonal rotunda (J21), also a Johnson solid. 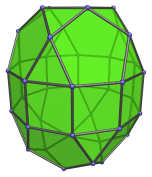 Elongating with a decagonal antiprism instead produces a gyroelongated pentagonal rotunda (J25). 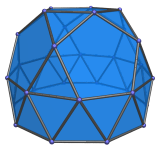 The pentagonal rotunda can also be attached to a pentagonal cupola, producing either a pentagonal orthocupolarotunda (J32) or a pentagonal gyrocupolarotunda (J33), depending on its orientation with respect to the cupola. The cupolarotundae thus produced may also be elongated by the insertion of a decagonal prism, producing the elongated pentagonal orthocupolarotunda (J40) and the elongated pentagonal gyrocupolarotunda (J41), respectively. 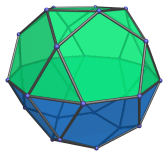 If two rotundae are used instead of a rotunda and a cupola, the result is the elongated pentagonal orthobirotunda (J42) and the elongated pentagonal gyrobirotunda (J43) instead. 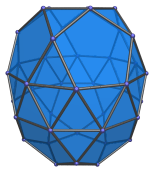 If a decagonal antiprism is used instead of the decagonal prism, we get either the gyroelongated pentagonal cupolarotunda (J47) or the gyroelongated pentagonal birotunda (J48), depending on whether a cupola or a rotunda is on the other side. Parallel projection centered on top pentagon. Projection parallel to a pair of opposite edges of the decagonal face. 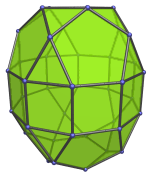 Projection parallel to a pair of opposite vertices of the decagonal face. This projection has the largest number of coincident elements. where φ = (1+√5)/2 is the Golden Ratio, A = √((10+2√5)/5), and B = √((5+2√5)/5). 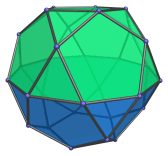 These coordinates give a pentagonal rotunda of edge length 2 in a “nice” orientation, with its 5-fold axis of symmetry aligned to the Z axis and its decagonal face resting on the XY plane. These coordinates do not give a pentagonal rotunda in a “nice” orientation, but they are algebraically nicer because they can be simply expressed in terms of the Golden Ratio φ, and do not involve nested square roots.